It’s a commonly held belief that we’re all naturally imbued with a certain level of psychic ability. This suggests that we all have the potential to fortify these spiritual tendencies. It can be frustrating to believe this if you don’t have any idea of what to do about it. Here are some ideas of ways in which you could strengthen and grow your natural gift. By using some of these techniques, you can move closer towards achieving your psychic goals. Taking ten or fifteen minutes out of each day for meditation can work wonders for your psychic abilities. While stepping back and ‘tuning out’ can seem anything but conducive to developing your ‘tuning in’ skills, the way it works is actually quite clever. When you relax, you let go of the turmoils and stresses of everyday existence. That sensation of transcendence and mindfulness? That’s how it feels when your energy increases its vibrations (which might seem odd, if you’re feeling chilled). Spirit energy vibrates at a higher frequency than your own; when you meditate, you raise yourself to a higher level of vibration, bringing yourself closer to the spirits, and thus increasing your connectivity. Meditation does not have to involve sitting with your legs crossed, eyes closed, humming. Meditation is a personal process, and our preferences reflect that fact. Walking can be a highly effective form of meditation. The key to making something meditative is to be disciplined in your approach. If you focus on every step, chant in time with your movement and (or) concentrate deeply on the functions of your body in transit, you’ll discover a well of mindfulness, which will ultimately fortify your psychic abilities. Deciphering energies contained within an object is an early stepping stone in your psychic journey. It’s a fairly simple idea, but honing in on your abilities in this area can be tricky at first. Psychometry is all about sensing the vibrations emanating from an object. To develop this skill, start by taking an object with an abundance of emotional meaning (it’s easiest with metal objects), holding it, closing your eyes and panning for psychic information. This can be a very rewarding psychic method, especially if you take it one step further and go on a spiritual adventure by visiting a historical site or antique shop. Immersing yourself in such a psychically rich environment can be demanding or difficult, but it also has the potential to engage your abilities in a way that will ultimately strengthen them. This is a great starting point, as can diversify what you take from an object or a space in line with your aims for psychic development; you could try for visions, sounds, memories, emotions, names… the possibilities are endless. Clairvoyance is the glamorous endpoint that most people aim for when they become aware of their psychic ability. Everyone wants to see the future. It might seem a bizarre suggestion, but ‘hearing the present’ can advance you towards this goal. Clairaudience allows you to ‘hear’ psychic messages. Practicing your hearing can increase your intuitiveness. By developing this, relatively accessible, psychic medium, you can prime your abilities for other areas. By regularly practicing focussing on the background noises you would usually tune out, you can tone and sharpen your psychic abilities, giving yourself a more well-rounded insight into the spiritual world. ‘Seeing’ auras is a very rewarding, quick to achieve aspect of mediumship. The method is simple: all you have to do is stand a friend against a plain, neutrally coloured wall, focus on their forehead from a distance of roughly eight feet and imagine you are looking through them at the wall behind. Soon you will see an aura appear around their head. 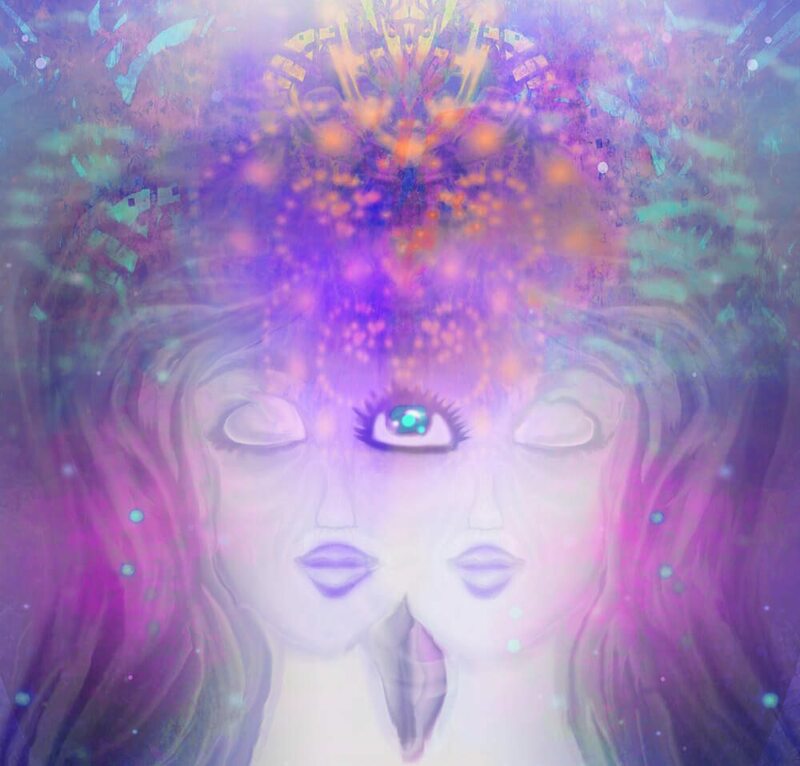 By practicing visualising the energy radiating from your subject’s third eye, you can polish your readiness to engage with people on a spiritual level, and soon auras will appear to you more naturally. Auras are a great way to develop (and monitor!) your psychic progression. It might sound absurd to suggest a ‘psychic diet,’ but it’s thought that some foods can optimise your vibrations, increasing your chances of connecting on a spiritual plain. Psychic diets are all about removing foods that offend your body. We all love a packet of crisps here, or a bar of chocolate there, but a diet involving junk food can actually inhibit your psychic abilities. Because the better your body functions, the better your body feels. And the better your physical health, the greater your psychical health. ‘High vibrational’ foods can help. While we’re all individuals who require different nourishment (and different levels of discipline), there are some good general rules to bear in mind when tailoring your idea to your spiritual needs. Whether you choose to act on all of these suggestions, or just some (or none! ), is up to you. Psychic diets typically avoid: caffeine, alcohol, processed food, pasteurised dairy products, meat, poultry, fish, white rice and flour, genetically modified and packaged foods. As with anything, the key to improving your psychic abilities lies in sound knowledge of the subject at hand. Whoever heard of a professor without a doctorate, a carpenter without an apprenticeship, a paramedic without training? If you want to become proficient at anything, a good rule of thumb is to gain a solid theoretical grounding in your area of interest. Strengthen your intuition by harnessing the knowledge of others. Spirituality is not an exclusive pursuit; any real psychic expert is more than aware of the fact that we all ‘have it in us.’ For this reason, within the spiritual community, there is little reluctance to share technique pointers. The briefest of Google searches will reveal a comprehensive catalogue of psychic advice, theories and histories. If you have a question, you can find the answer. One blog leads to another. You’ll soon gauge which psychics are respected, which offer you the best information and which are the most useful. Furthermore, there are plenty of books and resources extra to those on the internet. Engage with the community and learn established ideas — your psychic abilities will prosper! Developing your psychic abilities can be a minefield of frustration. Inevitably, some days you’ll feel like you’re just not getting through, and you might even begin to doubt your natural abilities. While the online community, as mentioned in the previous point, can offer a plentitude of reassurance and encouragement, sometimes there is no replacement for good old-fashioned human contact. Meeting like-minded people, receiving direct, tailor-made advice from an expert, helping others to troubleshoot their problems, and learning about new aspects of the spiritual realm, are just some of the benefits of attending psychic classes. Many people become conscious of their spirituality following the death of a loved one. Rather than staying at home, perhaps becoming lonely and upset, going out, making new friends, and receiving their support at a difficult time, could instil you with a positivity conducive to strengthening your psychic abilities. You can only benefit from entering into a loving, safe environment. Keeping a symbol book is almost like taking minutes in a meeting. Except there are no boring bits or loathsomely lengthy Powerpoint presentations, because the meeting is only between you, the future and your spirit guides. The process is pretty simple. Take out a notebook, a pen, sit down and tap into your existing psychic ability to invite your angels and spirit guides for help. Once they’re ‘with you,’ ask them to map meaning onto symbols. If you’re clairvoyant, ask your guides to mentally summon a visual, or, if you’re more of a clairaudient person, a sound. When they present you with each symbol, jot it down in your book. By recording each symbolic development, you can take more meaning away from events and readings that await you in the future. Delving psychically deeper into each aspect of your life can fine tune your abilities. Regularly journaling ‘formalises’ the psychic process. Not entirely unrelated to creating and maintaining a symbol book, it strengthens the link between you and your spiritual guides, as well as your higher self. By putting pen to paper, you can work out an issue you need guidance on. As you write, your psychic guides will deliver you to clarity and resolution through reasoning. As you elaborate on an idea or problem from a relaxed, removed perspective, you’ll see yourself reaching a natural conclusion; this is your psyche at work. Dream journals are extremely useful in this respect as well. By noting down your dreams, alongside developments in your daily life, and emotional/psychic events, you can better understand their significance. By writing it all down, you can observe the journey as a whole, rather that reminiscing separate aspects from an immersed perspective. Recording dreams is especially useful, because unlike our inhibited conscious brains, they defy logic and function at a higher level of thinking. Journaling gives you a vision of the bigger picture, making it easier to spot psychic linked and establish spiritual action. Maintaining this practice directs and strengthens your abilities. Turning to photographs can offer unparalleled levels of psychic insight. It’s really fun. Furthermore, photographs can be a starting point for research, opening up the exciting possibility of validation for your spiritual claims — it can be nice to have an indication of success in developing your psychic abilities, as often navigating unknown plains is riddled with uncertainty. For this practice, all you need is a photograph and your mind. Sit down with an image and focus. Relate to those depicted, relate to the photographer, consider the time and place. Mine all the information you can; senses, context, stories. The ephemeral qualities of photographs, their nature as frozen time, as senses captured, render them a source saturated with psychic potential. By harnessing the photograph and its unique characteristics, you can grow your proficiency operating in the psychic realm. What’s your moon phase personality?